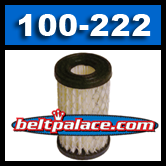 Home > CLEARANCE > Part# 100-222 Stens Lawn Mower Engine Air filter. TECUMSEH 35066 SEARS 1972 and newer with plastic canister. Replacement Air Filter for LESCO 050128, SEARS 63087A, TECUMSEH 35066, TECUMSEH 740019B, TECUMSEH 740095. Stens Part 100-222. Genuine Stens 100-222 in sealed factory package. 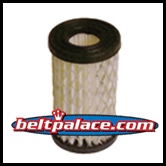 Replacement Air Filter for LESCO 050128, SEARS 63087A, TECUMSEH 35066, TECUMSEH 740019B, TECUMSEH 740095. Stens Part 100-222. Original Tecumseh equivalent 056-030 Air Filter. Made by Stens Equipment Company. Replaces original Tecumseh part. Fits Models SEARS 1972 and newer with plastic canister: Sears/Craftsman Part 35066, TECUMSEH ECV100, LEV90, LEV100, LEV115, OVRM60, TC300 and more! Factory Sealed OEM Replacement!